I love my first paging through a cookbook, particularly one as visually and deliciously stunning as “Baked: New Frontiers in Baking” by Matt Lewis and Renato Poliafito (2008). Usually, this initial “walkthrough” establishes my “must-make” list. 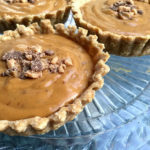 Without question, the Butterscotch Pudding Tarts in the book has always been number one. Well, it’s the holiday season, a time when peppermint rears its noxious and sometimes incongruous head in everything from chocolates to milkshakes to pancakes. But before I let you think I’m sounding somewhat humbug, know that AWS really does know how to celebrate the holidays.